Saturday's run at Mt. Falcon was a success. My knee gave me some intermittent aches during the first lap, but then went quiet during the second. I felt great running that last three downhill miles. What a difference a week makes! Jim P met me for the first lap. It's always a pleasure to share some miles with Jim. Jaime came out too and we had planned to meet on the trails. I have no idea how, but we probably passed by several times and never actually saw each other! At one point during the second lap, I stopped the watch and sat on the small bench coming up Parmalee. For about 4-5 minutes, I soaked in the sun and mountain views. By that time of the day, I was enjoying cloudless skies and windless 50 degree weather. Simply glorious. Post run I couldn't have been happier as I walked around the house completely pain free. That was until about two hours later I walked into AND connected my bum kneecap with the edge of a door! The next 5 minutes were spent rolling on the floor writhing in pain. I've never done that before, so why now!! How could I possibly be such a klutz? Right back to day one of this stupid injury I went...limping around the rest of the night. Thankfully, my newly induced pain went away on Sunday and has not returned. I'm back on track with Bandera training as I start heading into a taper for the next three weeks. I feel a bit like I've been tapering already, but you won't find me complaining. Funny how a minor injury can make you so thankful for what you previously took for granted. I just eclipsed 3000 miles yesterday and celebrated with a few fist pumps during my early morning trail run. My daughter told me a few weeks ago, that I needed to get busy in order to pass 2011 miles for the year, and I assured her that I was well past that and on my way to a new milestone. When I ran 2700+ last year, I thought for sure I couldn't get higher. I guess I was wrong. After taking a few days off to rest, I started running towards the end of last week. At first the knee felt okay, but it would get really stiff and sore at night and especially getting out of bed in the morning. I attempted a Mt. Falcon Double last Saturday and got through the first loop okay. About 5 miles into the second, the knee started complaining loudly and I couldn't finish the entire thing. My tail was definitely between my legs as I shuffled/hobbled back down to the lot. I had some serious doubts about Bandera at that point. This week involved another rest day and just light running, mainly on roads. I feel I've made significant progress in healing up, but tomorrow's jaunt back at Falcon will confirm or deny that. 6:00 a.m. for the first lap. 8:45 a.m. for the second if anyone is interested in one or the other. I'm planning on cruising at a slower to moderate pace and I believe the trail conditions will almost guarantee that happens. So was the slogan for the Hardrock Lottery Run last weekend. About thirteen hearty runners gathered at Todd G's house to head into the foothills behind Ken Caryl Valley for a snowy trek through the trails. After the run, we'd all stick around for some food & drink while the results of the lottery were being announced via Twitter. The odds of getting into Hardrock are minuscule. They operate on a ticket system and I had just one lonely ticket out of over 1300. I didn't expect to get in, but like the book Charlie and the Chocolate Factory, it only takes a single golden ticket to win a tour of one of the most amazing places on earth. With that slim bit of hope, I don't think anyone was immune to disappointment when the bad news dropped. Back to the pre-lottery run. With over a foot of fresh powder in most places and temps hovering just above single digits, this was one challenging run! Here's Todd leading us up...and up...and up! Our feet & ankles disappeared often. Patrick with his frosty feet on display. Half the group waiting at the summit. We had to start running again to stay warm. I didn't get into Hardrock, but my knee sure whacked one on the descent of the run! On the way down, I saw Rick Hessek slip and fall into a pillow of powder. As I came upon that spot, I proceeded to do the same, but my variation to his acrobatic move was to catch a large rock with my knee. Ouch. The pain radiated, but I started running again and it subsided a bit. Upon returning to Todd's house, I could feel it stiffening up and swelling. It wasn't until I got home that I saw the half-egg protruding from my knee cap. I don't think it's injured beyond a bad bruise. I'm walking okay today, so I hope to test it a bit after another day of rest tomorrow. Bandera is too close to risk not letting this small setback pass. During the lottery, it wasn't all disappointment. Brian Fisher got in, as did another guy named Gary from the Springs. For the rest of us, we look to next year and facing the astronomical odds yet again. Thanks Todd for organizing the run, opening your home, reading off the tweets, and giving us a place to laugh and sulk! I've come quite accustomed to seeing glowing eyes this fall and winter as most of my runs have been in the dark. But lately, the glowing eyes on the trails I run have multiplied. ATTENTION TRAIL USERS...We will be grazing the Highlands Point Trail in the HRCA Backcountry Wilderness Area beginning this week. Cows can be expected to be in this area through the middle of December. Do not approach or harass the cows. There are no bulls or calves, just peaceful, happy cows. They will avoid you. Should one be in the middle of the trail simply give them your best cowboy yell and wave your hands to get them moving. Grazing is beneficial to the grasses and habitat and is a fantastic fire mitigation tool. Brought the camera on my 5 AM run today. 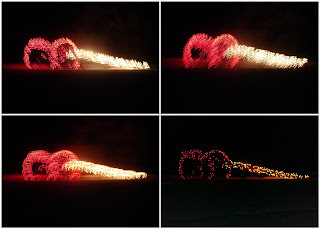 I'm comfortable with seeing the glow of deer or coyote eyes as they scamper away from me. But stick several 500+ lb. beasts right next to the trail and it's very nerve-racking. I have not partaken in cow harassment, but I'm certainly approaching them with waving hands. A few haven't budged and I had to pass within feet of these massive creatures! I'd be a pancake if they ganged up and charged. This is a "lightened" version of the two eyes above. This is the best I could get showing them right on the edge of the trail. I understand the part about the grazing being good for the land due to fire mitigation. But is it really worth it? Almost every stretch of trail now looks like the one below. Not to mention all the trampled vegetation and broken branches I've seen since this started. For perspective, this pile is the size of a large pizza and 5" high. It looks like I've got about two more weeks to enjoy my mornings with these "peaceful, happy cows." I'm guessing the piles on the trails are going to last much longer than that. I got out this morning for my first 5k in three years and set a PR at 19:15. I thought for sure I was going to be one of those guys that drops dead from a heart attack just before the finish line. Holy cow was that tough and unpleasant! With ultras, there's a long delay before the anguish & pain flare up. Today, that all began about thirty seconds in. It probably didn't help that I ran my fastest mile ever (5:54) to kick off the suffering. Mile two was uphill and into the wind. Mile three is a complete blur as I was looking to make sure the paramedics were available when I went down. Okay, it was just a little fun. But if it takes me another three years to race a 5k, I won't be sad. To those that go out and rock these short & fast races regularly, my hat is tipped to you. Early last week, I decided to throw an invite out to some friends to see who would be game for a 20 mile run on my local trails. I love the Highland Ranch trails, but when compared to those in the mountains and foothills, they're flat as a lumpy pancake. I wasn't sure anyone would take me up on the offer, so to sweeten the deal, I offered a post-race non-lumpy pancake breakfast. To my surprise, 15 people came out and provided me with one of the most enjoyable runs of the year. I run these trails all year long, and on occasion get to head out with another person, but never a group of friends. From Parker to Boulder to Evergreen to Roxborough, runners piled into my kitchen at 7am to warm up before heading back out into the 25 degree air. The forecasted winds of 25-30 mph never materialized and the sun eventually poked it's head out of the clouds and gave us a near perfect day to run. I led the group through all the twists and turns, zigs and zags, and eventually we made it back to my house. Thanks for snapping this pic Chris! I was hoping for an action shot on the trails. This was my first time leading a group run like this and let's just say I paced it a bit too fast. I was distracted while chatting and simply didn't think to look at my watch and slow it down. Thankfully, no one got lost, everyone finished, and in the process worked up a good appetite for breakfast. When I walked into the house, the smell of coffee, pancakes, sausage, and syrup filled the air. I've never smelled something so fragrant and desirable after a long run. Tanya had been working away while we were out running and put out an awesome spread. I think she flipped 70-80 pancakes! Later that day she joined some friends for a well deserved ladies night out with dinner and a movie. The 2011 running season is almost in the books, and Saturday's run was a great way to wind things down. It has been another memorable year running with friends and building community. I'm a lucky guy to have so many quality people in my life. Last weekend, I met up with Donnie and Leila for a run around Buffalo Creek. I was last there in March and was bummed it took me so long to get back. The running is superb and the company on this outing was equally as good. Donnie was getting in his last big run before the Hellgate 100k, and Leila just knocks these long runs out of the park for no reason at all. This long run was perfect timing for my Bandera training. It was also a good wake up call. For some reason, I tend to think I don't really need to fuel well on group runs. I'm not focused on it and I nibble to get by. Well, with about 3-4 miles to go, I faded fast. Lesson once again learned! I may be weird, but I really enjoy cruising through the burn areas. Why does this picture make me look 8' tall? We had dry trails all day except for several miles in the forest. Leila said my Hokas sounds like snow boots! The wind started picking up in the afternoon, but it could have been so much worse. D & L still crankin' hard several hours into the run! There are tons of cool boulders and rock structures scattered all round Buff Creek. 1. Jumbo Medal - I got a package in the mail last week from the NH Marathon organization. I guess I won the male open division (20-39). I knew I finished in 6th place overall, but didn't think about age group awards. I'm more excited that the five guys that finished ahead me were all in the 40's! I'll be there soon enough, so it's always great to be reminded that there are some solid running days ahead! The actual award is somewhat funny. It's a jumbo version of the finishers medal with "Men's Marathon Open First" inscribed on the back. Hey, I'll take it! 2. Perspective Change - I've kept my running up these last few weeks, but it has been a real test of discipline and determination since mustering up motivation has been a challenge. The recent wintery weather has really got me down. I can deal with the dark mornings, but I'm not ready for the consistent temps in the low 20's with wind and snow we've been seeing. I revisited a simple poem (Whether the Weather) I posted last year and realized I need to toughen up and accept that the only thing I can control is my response to the conditions. My morning run yesterday was the first after my perspective change. I ran 9 miles in almost 1.5 hours. It was slow-going on the trails, but I had a great time simply because I decided before the run that I wanted to. Good mental training and there's some life application built in there too! Reality: Snow run at Deer Creek last weekend. 3. The Daily Grind - I was thinking about the fact that I really haven't taken a break from running in the last three years. I don't feel I need to as I'm having fun, staying healthy, and avoiding burn-out. I also have resonated with those talking about consistency over the years (here and here). 4. Bundling Up - I've been thinking a bit about what Lucho has said recently regarding keeping warm. A large part of my motivation issues are due to the early season cold temps & wind. I usually wear just enough to get me through a run without getting too hot or cold. That first mile is always brutal trying to warm up. I'm going to give his suggestions a try by layering more than usual. 5. Bandera Prep - My training started about 2-3 weeks ago. I'm ramping up mileage and trying to get over to the foothills once a week. I started my training for Bandera last year around 11/1 and put in two big months of running before racing on 1/8. In hindsight, I ran way too much in December and really didn't taper much at all. Thus, the earlier start this year. I'd like to get in a double at Deer Creek or Falcon this month and then tackle el Chubbo Grande in December before the taper commences. 6. Numbers Game - I recently crossed the 10,000 mile mark a few weeks ago. I started keeping track of mileage in 2006 when I recorded just over 400 miles that year. I'm about 125 miles from passing my total from last year and only 380 away from cracking 3000 for the year. It's a little goofy to be chasing numbers, but it's just one of many small motivating factors that gets me up early in the morning to head out for a run! 7. 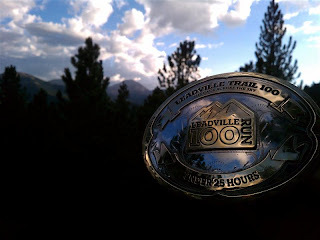 Leadville 2012 - It's on! This didn't make the Redemption Tour since I felt like none was needed. But I am looking forward to seeing what I can do here with one under my belt. Now, if I get into Hardrock?? Yikes. 2011 has been without a doubt my favorite year of running. It just keeps getting more enjoyable year to year. With that said, there are three particular races that left me feeling as though I could have run them better. I'm not saying that I didn't have fun or that my lackluster performance diminished the experience of each. No, it's that I simply came away with the desire to try it again. 1. 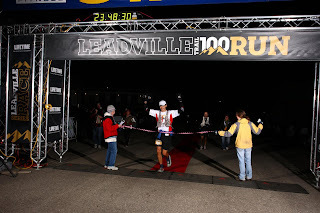 Bandera 100k (2011 = 12:10) - This was my first 100k and first ultra outside of Colorado. I ran it solo and encountered foot issues after the first 31 mile loop of running on rocks. I hadn't trained for the rocks, and I didn't know how to handle problems with my feet. The second half was painful and painfully slow, and my race report has a video that documents me saying I would never go back. Well, I'm going back, and my plan for the next 11 weeks is to run technical trails as frequently as possible. I was hoping to become best friends with Matthew Winters, but after my first 5:00 am rendezvous last Wednesday, I took a nasty fall on Dakota Ridge in the dark and whacked my knee. That officially soured our relationship. I think I'm going to be relegated to weekend duty in the foothills in order to get my rock training in. All is good with the knee, but had I not been dressed in layers due to the temp being 29 degrees with a nice wind, the fall would have been very messy. 2. 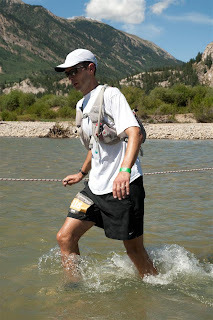 Moab Red Hot 55k (2011 = 5:16) - I was just barely recovered from Bandera when I ran this race last February. I started very conservative, picked things up during the middle, and completely fell apart at the end. I've got a few different ideas on strategy for this race, but I know that even having one run on this course will pay off in February. This course is astounding to the eye and soul. Registration opened in September and sold out in a day. I'm in. 3. San Juan Solstice 50 (2011 = 11:48) - Hopefully I'll get into this one. It also sold out in a day last year, and I'm guessing it will go even faster in 2012. A big reason for me wanting to go back is to run the standard course. Due to snowpack issues, we ran a difficult, alternate course which was still amazing in typical San Juans fashion. The angst I feel about this race is due to getting off course and panicking when I got back on. My fueling was a mess and my mental state was all over the map. I know running focused here would lead to a much better result. I'll be running other races in 2012, but these are the ones that made the redemption tour. Last Saturday was an interesting day...and race. After a very mild start to fall, winter decided to pokes its head out in a mean way. Just one week earlier, temps were in the 80's, but on this day, I awoke to rain at 5:30 a.m. that turned to heavy snow about 20 minutes later. The race websites states, "we race rain or shine." And now they can include snow to that list. 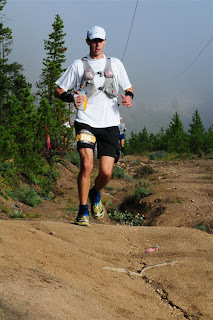 I was feeling pretty good going into the Wildcat Mountain 20 mile trail race. The soreness from running the NH Marathon the week before had disappeared and I felt ready for a decent effort. Last year, I ran in the 10 mile version, but when they rolled out the 20 mile option this year, I couldn't resist. This is the scene at the start line. Only 5 minutes before Go Time. Where is everyone? Here they are! Staying warm until the very last minute. 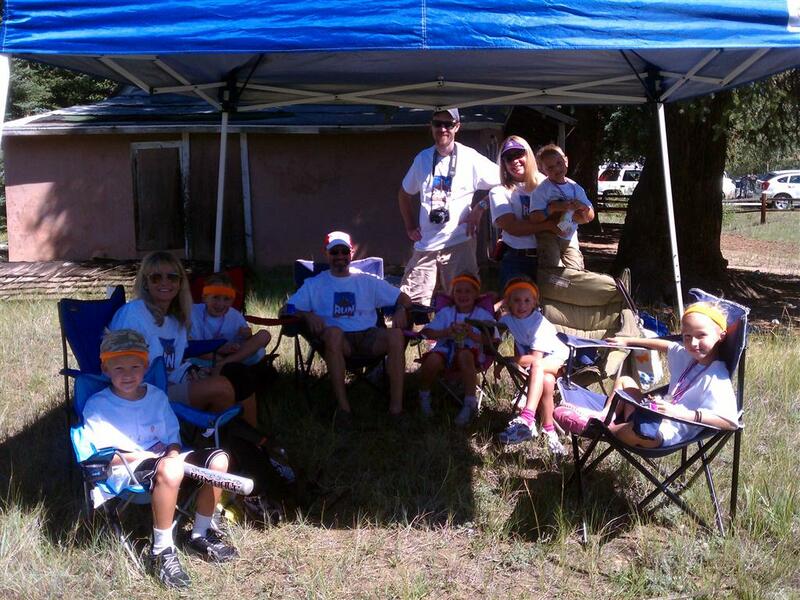 There were about 25 of us that started an hour before the 5 &10 mile races kicked off. I began with a group of five runners out towards the front. The lead guy took off like a rocket and I could tell he didn't quite know what he was doing. These conditions almost demanded a more conservative start as the trail was a mixture of snow, slush, mud, and puddles. After a mile we turned directly into the wind for a long stretch. It was biting and I kept asking myself if it was really October 8th. It felt more like a miserable January day. We ran an out & back section before heading into the Bluffs Regional Park for a longer out & back. Up to this point, the course had been marked well and there were several marshals directing us on where to go. But upon entering the Bluffs, there was an unmarked intersection and the top three guys took a right when they were supposed to go left. I started to follow, but had a flashback from Lake City and turned around. Fifth place came up behind me and I told him of their error. He opted to follow them since he assumed they knew what they were doing. As I plodded along, I came upon a course marker, so I knew I was heading the right way. I came across a course marshal out there and told him I thought everyone was taking the wrong turn and he got really flustered about what to do. Sure enough, about a mile later, all the lead guys start coming at me as they continued their loop around the park. I got several strange looks, but they just cruised on past. Then the streams of runners came next. By the time I hit the turnaround, about 15 runners had passed me going the wrong way. I'm pretty sure the shortcut they took shaved just over a mile from the course. At this point, I'm beginning to think I'm in first place and that got me running strong and focused. It was also the time that my legs started to rebel. The entire backside of my legs (hamstrings & calves) were as tight and sore as ever. I'm guessing the marathon effort from a week earlier caught up to me. But I couldn't slow down now! I had no idea when I would ever get so lucky to be running in first place again, so I simply couldn't blow it. The race director was aware of the course mishap and asked me if I ran the correct course. I said yes, but I honestly have no idea how she is going to figure out who did and who didn't. They made an announcement that they were going to sort out the issue and announce the results via email, but as of today, nothing has been announced. I understand their problem, because if they award me first place, they'll have to disqualify a whole bunch of runners. But if they just leave the results as is, they'll be ignoring the fact that most ran only 19 miles. Oh well. This race was fun, but due to the weather, very unorganized. They also need to figure out how to start the 20 mile race so the front runners don't come up behind the back of the pack 5 and 10 milers. That part of the course was singletrack and many were walking with headphones on. The race did make one thing clear to me. Going hard on back to back weekends is probably not for me. 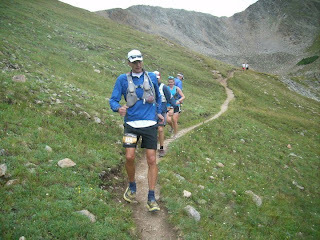 During the last few miles, my legs felt just as they had during the final miles at Leadville. They were toast for the rest of the weekend. Had I just kept it slow and steady on Saturday, I would have been fine. I'll definitely give this race another go next year as I'm sure they'll have all the bumps smoothed out. I'll post again when they finally figure out how they're going to release the results. On Saturday, I ran in my third New Hampshire Marathon. Previously, I ran in 2007 & 2008 and both runs were new PRs for me. 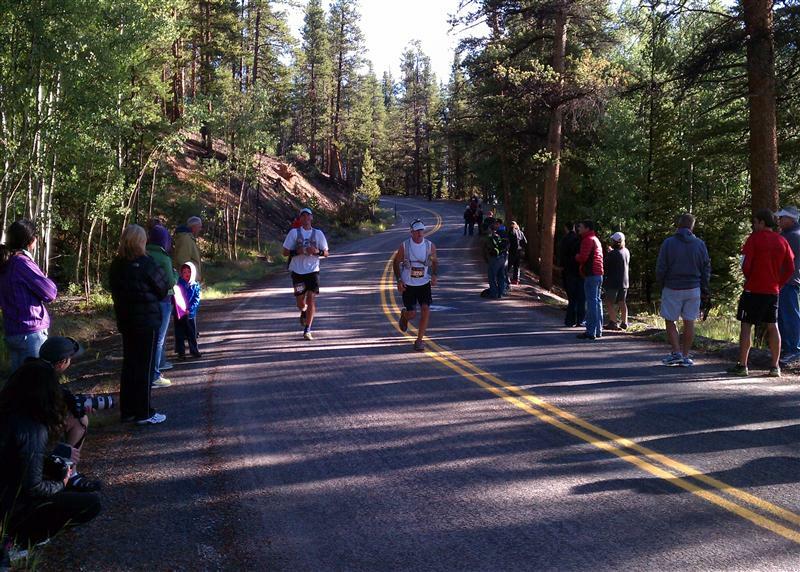 The course is very hilly with about 1850’ of elevation gain, so it's not one most runners typically go for a PR on. This race is all about the 50 States Marathon Club and Marathon Maniacs. With New Hampshire on Saturday and the Portland (ME) Marathon on Sunday, many of these folks come in from out of the area to bag two marathons in a weekend. 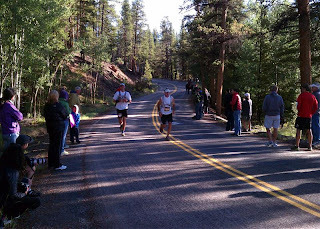 In 2007, I ran it shortly after my brother-in-law, Jim, had surgery for melanoma. He was a part of the race and our family rallied together to support me during the race, but also Jim as he was about to enter the chemotherapy stage of his treatment. In 2008, my sister, Jim, and their girls returned to support my second running and it was days after the race that we found out his melanoma had spread throughout his entire body. The race was the last time we gathered as a family before Jim’s memorial service two months later. Needless to say, there is a huge emotional piece to this race for me. This year, I coordinated with my long time friend from high school (Brian) and our families met up for the weekend. Brian ran the half marathon and rocked it having a solid race running injury free! A 22 year friendship that keeps getting better! In my mind, I was calling this race “a grand experiment” because I was curious to see how my body would respond to a fast marathon attempt only 6 weeks after running Leadville. Having never run 100 miles before, I wasn’t sure shooting for a quick pace over 26.2 was a wise idea, especially with no specific speed work and almost no road running. On race day, I awoke to overcast skies and temps in the upper fifties. My dad gave me a ride into town and dropped me off about 30 minutes early. With fifteen minutes to the start, the rain began falling and didn’t stop all day. I’ve only run one other race in the rain (2007 Denver Marathon) and while it’s not the end of the world, I much prefer a dry day. 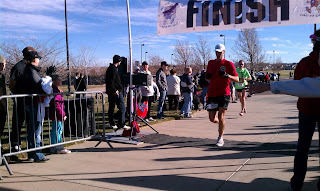 Once we got started, I found myself in the top 20, which was not a huge feat considering there were only 227 runners. I was hitting the low to mid sevens and I kept telling myself that it felt comfortable. The truth was that I had no clue if it was comfortable or not since I hadn’t trained for a specific marathon pace. At mile three, I had a bug fly into my eye. Now THAT was uncomfortable! I couldn’t get it out, so I just kept rolling it around until it didn’t feel like a rock was lodged in there. At mile six, I ran by my family. They were hearty spectators braving the rain to cheer me on. I blew past and gave a few high fives. I think I was in 15th place around now. I kept advancing places because I ran with a handheld bottle and skipped all but one aid station. More hills followed and the miles ticked away. After mile 11, you begin a long out & back section that gives you a good chance to figure out where you stand. I entered the turnaround in 12th place. It wasn't until mile 17 before I made my next move and hit the top ten! Then began the long stretch of running solo and continuing the loop around the lake. At mile 20, I passed a spot that I remember so vividly from 2008. My family was spectating at a friend's condo and Jim had rushed out on their deck as I ran by. He was the only one out there hootin' & hollerin' for me. It was bizarre to look up on Saturday and see him there again cheering me along. Then next thing I knew, he was running along side me! Oh man, was that moment surreal and sweet. No, I'm not going crazy at this point. It just seemed like I could feel his presence more than ever before. And boy did it make me want to dig deep and finish this thing strong. The next six miles included splits of 7:06, 6:43, 7:33, 7:15, 7:23, 6:55. By far the most consistent I've ever been at the end of a marathon. I also flew past several more runners that were beginning to struggle and ended up crossing the finish line in 3:11:02 and 6th place! This was over five minutes faster than I ran it in 2008. Coming down the chute holding my "paper" bib on. Mix in rain and it didn't hold up too well! All in all the rain did not dampen another fantastic run in New Hampshire. It was a treat to get to spend time with Brian and his family. Mom & Dad once again showed strong support and kept me fueled with Dunkin' Donuts coffee all weekend! I so wish I could have experienced another NH Marathon with my sister and nieces, but my time with Jim was awesome! Lastly, I thought I had nailed another Boston Qualifier, but learned once again after the race that I came up short. The new qualifying standards for 2013 now put me at needing a 3:10:00. So in 2008, I missed by 12 seconds when I ran a 3:16:11...and now 62 seconds in 2011. Hmmmm...I think I know what my goal will be for a future NH Marathon! This afternoon we had a reunion of my crew and pacer from Leadville. It was great to get together and laugh about all the funny moments during the race. They were an amazing support for me and I thoroughly enjoyed sharing the experience with them. 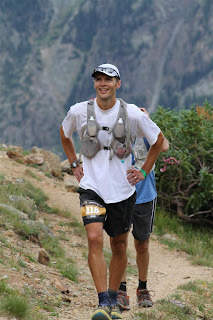 My brother-in-law Steve took several hundred pictures that captured what they did to help make my race successful. At the picnic, I shared a video I put together that portrays how the day & night unfolded for all of us. Click on the full screen button to actually see it. Not too much has been happening on the running front lately. I'm still recovering from Leadville, but have had two decent weeks of getting back into the groove with regular runs. No real training, just getting out the door and seeing what happens. I'm looking forward to the New Hampshire Marathon on 10/1, and have pounded more pavement in the last two weeks than I have all year. I don't have any big goals for this race other than run a somewhat decent time, have fun, and see just how much of the race I can run on the dirt shoulder. My parents live on the lake that the course encircles, so we're looking forward to visiting with them. I'm also excited to see and spend time with my long-time high school friend, Brian. He's coming up from Virginia with his family and he'll be running the half! Last weekend was the kickoff to the youth soccer season and my duties as a ref are going into effect for the next seven weekends. With other commitments crowding the weekend, I decided to take in the full moon and hit the local trails at night on both Saturday and Sunday. I'm sensing this will be the standard plan if I want to get my long runs in during soccer season. Saturday night was a solo run under the lit up sky. Twenty slow miles cruising the trails and never once took out my light. It doesn't get much better than that. I was loving the feeling of gliding through the night and joining the party with all the critters out there. There were many places along the way where shadows were cast upon the trail, but I've mastered a style of running that resembles dancing on hot coals. It no doubt looks quite goofy, but it's effective at keeping me in a vertical position. Sunday night was a group run coordinated by my friend James. We hit up the Bluffs Regional Park in Lone Tree and did a couple laps. He's got a great group of guys from all running abilities meeting there on full moon nights. 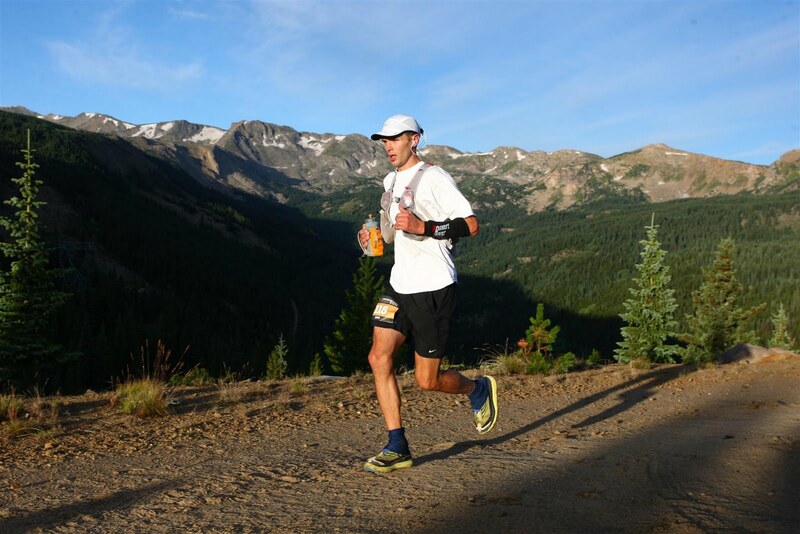 Two were Pikes Peak Marathon veterans, one had run the Estes Park Marathon last June as his first....and one guy had never run more than 2.8 FLAT miles. He rocked the hilly loop for a new long run PR! With the race season winding down, I now have a little more time to fiddle with the blog a bit. 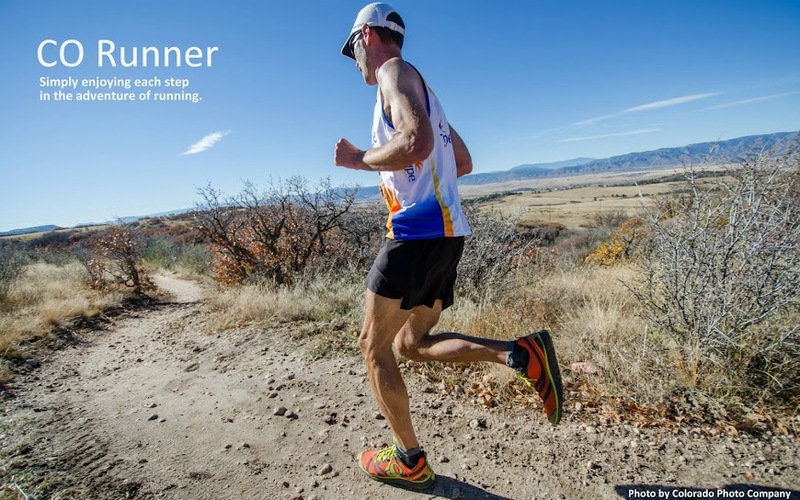 On Wednesday, 9/7, I'll be changing the address of this blog from co-runner.blogspot.com to just co-runner.com. The old address will still work even after the change. What won't work is if you happen to subscribe to a feed of this blog through your favorite RSS reader app (ie. Google Reader). You will need to change your subscription to match the new address. I've always considered running to be a gift that I just happened to open in my early thirties. I've never thought that I'm particularly good at it, but more in terms of a way for me to use the body and mind God's given me to get out and enjoy His creation. There is simply no other way for me to explain the grandeur and majesty that is found in the mountains and my capacity to see it as such. Over the years, my runs have gotten longer and longer, and the places I've seen and experienced keep getting more beautiful. Sure, I get sappy with what amounts to a sweaty and smelly endeavor, but I do know that each day I have to run is a blessing. It could end tomorrow for whatever the reason, and thus I grab hold of this gift and enjoy the ride. In running, there's a "first" for each race at a new distance you encounter and all those "firsts" are memorable. I can remember the pain of an injured knee during my first half marathon. I vividly recall hitting the wall HARD at mile 18 of my first marathon. 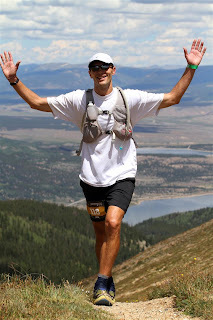 Oh and the elation I felt above treeline during my first Pikes Peak Marathon. I can't forget to mention the longest run of my life during the Silver Rush 50 miler last summer. With that said, I knew running my first 100 miler would be memorable on so many levels. I wanted to soak it all in and enjoy sharing the experience with my family that came to pace and crew. I really wanted my Leadville story to have a happy ending and I can say that I was not disappointed. I'm quite late to the party putting out a race report and I think that's because I've just wanted to sit and enjoy the memories in my head before I spit them out on the screen. I know all too well that races don't always go the way you hope they will. They're are hard, unpredictable, and often leave you frustrated with the outcome. I've had my fair share in this category. I worked a half day before heading up to Leadville for the race & medical check-in. I bumped into Andy from Leadville and chatted a bit before getting in line. I was in & out no more than 10 minutes after I started. The whole weigh-in thing had me pretty nervous since this was the first race I've ever had to do so. I typically lose a bunch of weight when I run and I didn't want to weigh in on the high side. I stepped on the scale. 188.9 lbs. Not too bad considering I'm usually 187 in my birthday suit. I was also banded. The green wristband signifies your life during the race. If it's on, you get to keep going. As soon as it's cut due to getting pulled or dropping, your race is over. I had another lifeline on my other wrist. My daughter Megan frantically braided me a special LT100 friendship bracelet to wear during the race. I can tell you I looked at it many times to remind myself of why I needed to keep going. Setting an example of finishing what I started and challenging myself to work through adversity while moving beyond typical boundaries are values I want to instill in my girls. The more important family wristband. That couldn't be cut for any reason! After dropping my stuff off at our cabin in Twin Lakes, I shot back up to Leadville to hit up a BBQ hosted by Brandon. I was a little late, but there was plenty of food and conversation left for the taking. There were quite a few laughs and relaxation was easy. Next thing I knew, about two hours had passed. A huge thanks to Brandon and his sister Natalee for putting out a delicious spread for everyone. Back at the cabin I had a fitful night's sleep. I was alone and the creaky cabin made noises. I hung out at the cabin in the morning before heading to the pre-race meeting. At the meeting I bumped into a whole lotta folks and asked the obligatory, "Are you ready?" Most were. The legendary Ken Chlouber kicked things off and got us all pumped up. He has a natural way of motivating people, especially with his famous quote, “You're better than you think you are and you can do more than you think you can!” Dr. John Hill also spoke for quite some time about the medical side of the race. I heard him speak at training camp and he's one entertaining guy. By the end of the meeting, Ken had everyone on their feet chanting, "I commit I will not quit" repeatedly. That afternoon I got sleepy and made the mistake of taking a nap. Only 45 minutes, but the damage was done. I awoke just in time to greet Tanya & the girls in a groggy state. We started making dinner and then my cousin Scott and his family arrived. Dinner and then a crew/pacer meeting to go over final details ended the night. All was good. Time for bed. Lights went out at about 9:45-10:00, but the lights were burning bright in my head. I wasn't nervous. I just wasn't tired. That dang nap! Just when I thought I might snooze off, a storm came upon us and the rain, thunder, and lightning all began. I immediately began to project that weather on the following night and...okay, that got me nervous. Next came the realization that I hadn't packed spare batteries for the morning darkness and I thought for sure my batteries would fail and I'd be stuck in the dark. Irrational, but that's what happens when you lie there staring at the ceiling for hours. The last time I looked at the clock, it was a little before 1:00am. The alarm went off at 2:40, so that had me beginning race day on about 1hr40min of sleep. Not good, but the adrenaline was flowing, so it didn't bother me much. Tanya got up with me and drove me to the start. As expected, it was a quiet ride with the exception of going over a few more crew details and she offering up some last minute encouragement. The scene at 6th & Harrison was hopping for 3:30 am. I hit up the port-a-potties, took a picture with Tanya, sneaked a kiss, and faded into the crowd of runners corralled at the start line. You think it was a long day for me? Tanya was also awake from start to finish. 4:00am and we're off! You'd think a 5K just started with how fast the pace was out of the chute! As the sea of handlamps ran down 6th Street, I'm sure there were at least 200 runners ahead of me. Well, you can see just how many shot out of the gate before Tanya shouted for me as I crossed the start line. I was nervous about getting stuck behind people walking on the lake trail, but also knew there were many wide open miles before we hit that trail. So I just relaxed and tried to get in a groove heading down the Boulevard, on CR-48, and the hike up mini-powerline. The lake trail was slow, but the group I was in ran almost the whole thing. The best part was that I was last in the train. I had promised myself that I would pass no one unless they pulled over for a break. About 10 miles in, I pulled over for a bio break and even with a 2 minute stop, no one passed me and I caught back up to the group with minimal effort. I also pulled over once to just marvel at the string of headlamps and flashlights lining the entire lake as the 600+ runners plodded to May Queen. It was dark and foggy, so the effect was spectacular. The aid station was packed. I had planned for Tanya to skip this one, so I refilled my bottle and took off. I was about five minutes behind on my first split, but I kept saying to myself, "no one I know has ever complained about getting to Winfield (the turnaround point at mile 50) too slow." 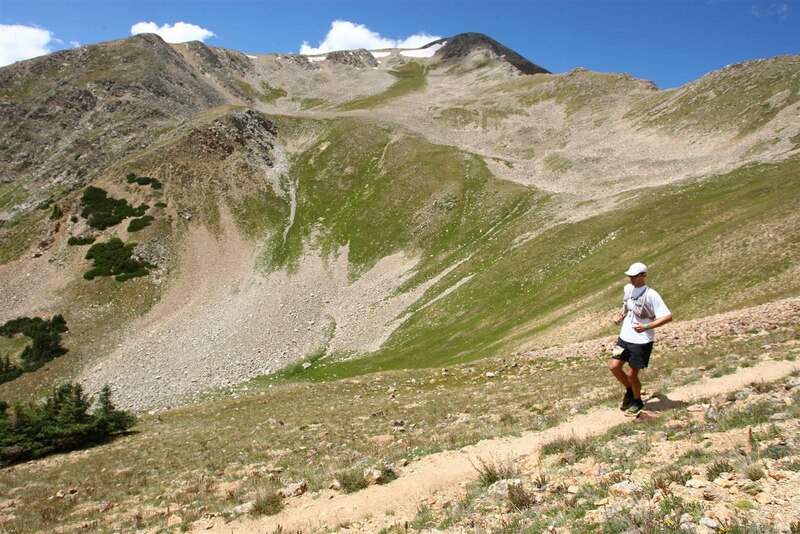 I also promised myself that if I got to Twin Lakes Inbound (mile 60) with boundless energy, I was free to let 'er rip. Ha! I knew that would NEVER be the case, but it helped set pacing boundaries early on. After the two miles or so on the rocky and gently climbing Colorado Trail, I popped out on Hagerman Pass Road. This dirt road begins the climb that takes us up and over Sugarloaf Mountain. The sunrise over the lake was pristine. After several hours in the dark, the rising sun got me fired up. Sunrise over Turquoise Lake. Taken from Hagerman Pass road. At one point thought, I was getting a little distraught because I could feel a hotspot developing between my big toe and it's neighbor. I had taped those toes the night before due to previous blister issues, so that shouldn't have been happening! Well, the pain was such that I knew ignoring it would come back to haunt me, so I found a rock on Sugarloaf and took my shoe and sock off in order to rip off the tape. Once I got back to running, the hotspot disappeared and my foot was happy again. I bombed down the Powerlines a tad too fast, but then recovered a bit on the road section to Fish Hatchery. I was met by Tanya and was so happy to see my first familiar face. She handled crew duties on her own during the early morning before getting assistance in the afternoon. As was the M.O. for the day, she had me sunscreen'd up, restocked and off running in no time flat. I had gotten back on schedule and was feeling strong. The video below shows just how packed Fish Hatchery was with crews. This short road section wasn't too bad. Tanya had taken my pack, so I ran with just a bottle in hand. It felt great to give my shoulders a break. It would be the only time during the entire race I wasn't wearing my pack. The Treeline crew stop was already filled with cars, but I found Tanya quickly and grabbed what I needed for the next long stretch to Twin Lakes. Once again, we were fast in our exchange as I grabbed my pre-loaded pack and kept on moving. This section has it all with ups and downs, wide jeep roads, and narrow singletrack through aspen trees. My favorite part are the views of Mt. Elbert as you clip its eastern side. My least favorite part was the never-ending views of the Twin Lakes area. I'm not kidding when I say you can see the lakes and the town for about an hour before you get there. During this stretch, I started feeling some discomfort in my stomach and legs. I was actually surprised it took so long for my stomach to wake up and realize what I was doing to it. Usually he kicks and screams shortly after mile 26. I had been fueling well, but noticed I wasn't really keeping to any specific schedule. Typically, I'm on a strict 300-400 calorie per hour deal. On this day, I had no idea what I had ingested over the previous few hours. I decided to let it slide and work through the bad patch. I dropped into the TL aid station about 20 minutes prior to my planned split. I knew my crew would be there, but OH MY was it a scene of near pandemonium. People were everywhere! I ran through the checkpoint and started down the road looking for my crew. Nothing. I walked back to aid station thinking I might have passed them. Nothing again. Finally someone said there were crews around the corner. I ventured on and still could not spot anyone familiar. The realization started sinking in that I'd be tackling Hope Pass without the fuel and gear I had planned to pick up at Twin. I chatted with a lady from another crew who offered to reload my supplies, but figured I had enough to get me to the next aid station. So I crossed 82 and began my run towards Hope. Lo and behold the very last crew down the trail towards Hope was mine! They were shouting and cheering for me not knowing that I had spent about seven minutes looking for them. They felt awful, but I felt even worse realizing it was completely my mistake for not telling them exactly where the aid station was. Well, they snapped into action, and next thing I knew I was sent back out onto the trail. Actually, that was their promise to me and motto as a crew. "We'll get your tail back on the trail." They have the shirts to prove it! I also need to point out that I may have been the only runner with an official "Kids Crew". Their sole job was to cheer like crazy when I passed through. Jennifer - aka Kids Crew Chief & Cabin CEO. She was invaluable team member keeping six kids going all day & night. Time to "Go BIG or Go Home"
This section was the only stretch I had not previously run in training. I just didn't have time to get up there to experience it, so I looked forward to the surprise during the race. Oh boy, did it surprise me good! First came the water crossings. I didn't count, but I'm guessing there were 6-7 with some being glorified puddles, and others being full fledged rivers. None were too deep and they actually felt good. My shoes instantly weighed 10 lbs more and towards the last one, I started getting the chills. Before long, the climb up Hope began. In my mind, I had pictured a long, but gradual climb. With 40+ miles on my legs already, there was nothing gradual about it at all! The 3400' climb seemed steep and relentless to me and the longer it went up, the more I started feeling my stomach bloat & cramp. Once again, I kept eating as best I could, but there was absolutely NO method to my eating madness. I just got down what I could and tried not to fear the repercussions of what could come later if the lack of calories caught up with me. The Hopeless aid station sits about 800' below the pass at treeline. There's quite a tent city setup with about 20-30 llamas scattered around the grasses. Why llamas? Well, how else do you haul up tons of gear, food and water? Those llamas are a huge part of the race and provide a surreal sight to the tired eye. I passed through the aid station with downing just one cup of Gatorade. I felt a strong need to get off the pass quickly in order for the bloating to dissipate. Top of Hope Pass celebration. As I crested the summit (12,600'), I couldn't believe how pristine the weather was. 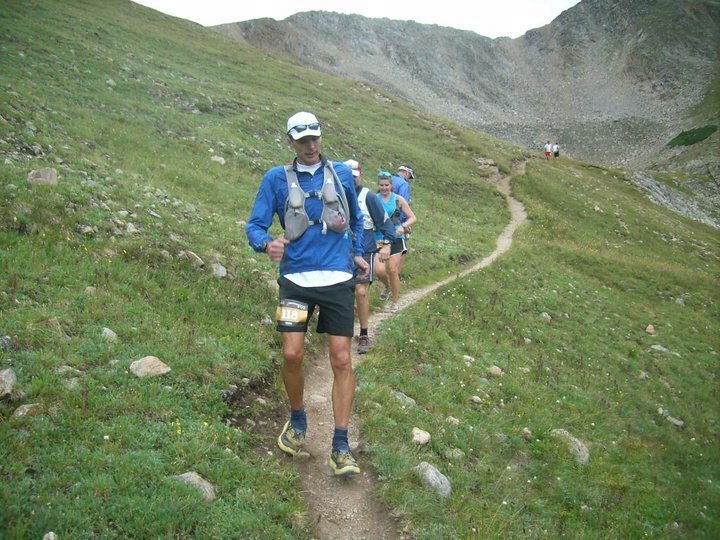 The race organizers scare the pants off you about how bad it can be up there in order to get you to carry enough gear for all conditions. None of that would be needed now. Time to drop 2600'...and start feeling better. Getting off Hope Pass. Wish I could have enjoyed the scenery a bit more. No more than three minutes after I began my descent, Ryan Sandes, leader and eventual winner came hiking up. I can't say he looked good, but I can tell you he was focused and determined. Many other frontrunners started coming up with everyone huffing and puffing except for my friend Brendan and his pacer Stephen. I've gotten to know Brenden a bit this year, and his Leadville back story is by far the most inspiring. He and Stephen were popping up Hope Pass chatting and laughing like they were taking a stroll through the park. Unreal. Brendan went on to finish in 11th place! The rest of the descent was uneventful other than the bloating in my stomach disappearing! I hit the 2.5 mile dirt road to the Winfield turnaround and jogged most of it, passing a few running friends as they began their journey back to town, and met up with Scott (my pacer) and his wife Catrina at Winfield! 50 miles done...and I was still smiling. Wait, I had to step on the scale here and get weighed. Fear took over that they'd find me down 10 lbs and pull me aside until I could get enough fluids down to satisfy their requirements. As the scale's screen went blank, it seemed like an eternity before the number appeared. 185.8. Sweet!! Only down 4 lbs and the medical person confirmed my joy by saying, "Great! You're good to go." Catrina was a rock star and braved the dreaded drive to Winfield to drop Scott off and crew for me. She got me all prepped and ready to head out for LT100 Part II. I need to pause here and tell you a little about my pacer Scott. He was AMAZING! He is an accomplished runner who recently ran a 2:58 marathon and tackled the Golden Gate Dirty Thirty in June. When he offered to run the entire second half with me, I couldn't think of anyone better. I can say with confidence that his presence was the number one factor in my success during the second half. He knew just when to encourage me and never once expressed that he was dealing with any issues or discomfort...did I mention this was his first time running 50 miles! He was so positive and upbeat, but in a natural and effective way. At one point, I pulled over to for a bathroom break. Next thing I know, Scott is saying, "way to go Woody for staying on top of your pee!" I laughed good and told him that was easily the line of the day. Scott ran behind me almost the entire time. It helped me to have him there because I felt like his presence was a gentle push. But let's say being behind me probably was quite unpleasant with bodily smells having nowhere else to go. Again, no complaints. The other thing Scott persevered through is about 8,341 deep & rapid fire burps. I have no idea what was wrong with me, but they just kept coming all night long. I'm sure if you heard me, you would have thought I was about to throw up. I wasn't, but it sounded awful. Just imagine listening to that for 13+ hours. So Scott & I took off from Winfield and I was feeling awesome! I was excited to talk and share some of the highs & lows from the first half. I knew that would be short-lived once we started back up Hope Pass. Sure enough, the brutal climb back up Hope zapped any pep that I had and transformed me into a snail. It didn't help to have non-stop traffic coming at me from those still descending. It's almost all singletrack, so passing by became a frustrating challenge. I also felt the dreaded stomach bloat returning the higher we climbed. As we got within a mile or so from the summit, the cloud cover thickened and the rain started. It wasn't bad at all, but enough to cool me down that I needed to don my jacket. Hands on the hips always means I'm wiped! The summit didn't come fast enough, but once we were there, I couldn't wait to show Scott the view AND just how far away Turquoise Lake looked! It's quite baffling because it looks about 200 miles away and that's where we needed to go. Oh well, down we went. My downhill legs were not feeling all that good, so I started getting passed with regularity. No worries. There was still SO much race left to go. We passed through the llamas at the Hopeless aid station and I took a quick peek into the medical tent. Many runners were strewn out with IVs in their arms. Their races were done. That would be the last time I looked into a med tent. We made steady work of the descent, then came the water crossings, and a mile jog back to Twin Lakes to meet up with our crew! Arriving into Twin Lakes with wet, sloppy feet. This stop was extended a bit by the need to change shoes & socks and grab our night gear just in case we slowed down and encountered darkness before the next crew stop. I'd say this is pretty good for 60 miles. Leaving Twin Lakes found us climbing about 1200' in a mile or two. It's a tough climb and I was dreading it. All in all it wasn't too bad. After the climb, we got into a good running groove and tackled the rolling hills to keep the miles passing by. The hiking breaks started to get more frequent now, but overall we were doing quite well. What wasn't going so well was my eating. I really wasn't hungry and the thought of most anything caused my stomach to turn. I knew this would become a major problem, so I ate just the minimum amount of EFS to get by. Scott seemed a little concerned about my eating, so I promised him I'd eat something substantial at the Halfpipe aid station. I fulfilled that promise with some ramen noodles and broth. My stomach became happy and it was plenty to get me the next three miles until we met up with the crew at the Treeline crew stop. Those three miles went by quickly and we "called in" to the crew via walkie talkie to let them know we didn't need anything and would just pass through this stop before spending more time at the Fish Hatchery aid station only 3.5 miles beyond. This is when we started to hear that Steve was serenading everyone with some music and song. Talk about someone you want to have on your crew to provide entertainment while they wait for hours on end! We almost stopped and hung out to take in the concert. Enjoy a little taste below. Man, is he good or what! 3.5 miles of almost flat running was all we needed to get through before we hit the Fish Hatchery. Easy right? Then why is it that this section is one of the most difficult and hated of the course? Well, I found out. The miles of flat road running hurt like the dickens, and the monotony is enough to make you brain dead. It is also the point you cross the 74 mile mark and realize you have a MARATHON to go. Scott & I plodded away in the dark. The road was busy with traffic, but I barely noticed. The fatigue of the day was hitting hard! I ran with my eyes closed for long stretches. Not smart, but I reasoned that getting hit by a car couldn't hurt much more than the pain I was already enduring. When we got about a mile from Fish Hatchery, Scott could tell I was fading. He wisely spoke up and made me promise again to eat something at Fish in order to prepare for the big climb back up Sugarloaf. I wasn't thrilled to think about eating, but he was spot on with the advice. The climb up & down Powerlines/Sugarloaf would encompass ten miles and over three hours until we hit the next aid station. I really needed to eat. I really needed caffeine too. I stumbled into the aid station and was looking about as bad I could. Everyone had a look of concern as I resembled a drunken sailor more than a runner. I got up to the building with the food and started eating a cup of noodles. That's when I noticed the chair sitting against the wall, and boy did that chair look good. It was a simple folding chair, but at that moment it looked like a plush and exquisite throne. Now, I had prepped my crew beforehand with the phrase, "beware of the chair". I told them to keep me away from chairs as much as possible as they are nothing but deceiving traps. I slowly moved over to the chair and sat down. Next thing I knew, Catrina was in my face with her index finger pointed in the air in front of my nose. "One minute. You get one minute in that chair and then I want you up." As much as my insides crumbled at her words, I knew it was the best thing and I admired her determination to "kick my tail back on the trail". Thank you Catrina! You saved me significant anguish had I sat there any longer! Farewell Fish Hatchery and thanks for the belly full of Coke, soup and noodles...and a No Doz pill! Leadville allows trekking poles during the race. I knew they would probably help, but decided pre-race that I wanted to complete the race without them. That's all fine and dandy until you get to mile 76 and are faced with a scary climb up Powerlines that is known for eating runners alive. I have one pole that I got years ago at Walmart for $10. It is nothing special, but upon leaving Fish, I asked for the pole. A huge decision that paid off. It was awkward hiking with only one pole and my arm would tire out quickly. What it did do was keep me upright and continuously providing an ever-so small push with every other step. Heading towards the Powerlines climb. Scott's got the pole! I wasn't sure how many false summits there were on Sugarloaf, but I knew it was in the 5-7 range. I'm pretty sure that night it was more in the 14-15 range. After an hour of climbing, I told Scott I'd take a big swallow of EFS to celebrate hitting the top. I gulped it down on top of a false summit and another 20-30 minutes of climbing up followed. Argh! My favorite saying of the day was, "this too shall pass." Something about saying it brought a peace knowing the end of whatever was seeming endless, would eventually come. It always did. I'm quite sure I said, "this too shall pass" about 100 times climbing Sugarloaf, and guess what? It did. Finally, we were running down the backside, down Hagerman Pass road, down the Colorado Trail towards the lake, and into the May Queen campground aid station. The crew was ready for action. More noodles. More caffeine. Fresh batteries in the flashlight! Coming in the last aid station! We're beginning to taste the finish...that is still over three hours away! More Ramen Noodles! My primary fuel source for the last 30 miles! There not much to say about our run on the lake trail. I'm sure I burped much more than I talked. The trail constantly bounces up and down with plenty of rockiness tossed on. Everything in me wanted to walk the final 13.5 miles, but there was absolutely nothing wrong with me to dictate that course of action. Yes, I felt awful and my legs hurt beyond imagination, but again, I wasn't injured and there was no reason not to shuffle. When we popped off the trail at the Tabor Boat Ramp, our crew was ready for the final prep to get us to the finish. I can't remember at all what happened here other then saying, "see you at mile 99". Wow, mile 99...were we really that close? After Tabor, the lake trail flattens out and the rocks pretty much disappear. It's great for running and I had mentioned to Scott several times that I was looking forward to this stretch. The walk/shuffle intervals continued all the way until we finished the trail, hobbled down the nasty mini-powerlines section, cruised along CR-48 and onto the Boulevard. The Boulevard is a dirt road that steadily climbs for three miles. I'm convinced there isn't a darker place in Leadville. There were lots of runners on it wrapping up there races and we were all leapfrogging each other. Leila passed me with her pacer Becca. I can tell you there is no one I would rather have pass me than Leila. She's a good friend and incredible runner. I was honored to even be running near her during the final miles. About halfway up, you see a streetlight off in the distance signifying the end of the Boulevard. I can tell you that light is magical. It moves further away the closer you get to it, which of course makes my "this too shall pass" mantra ineffective. Somehow the magic ended and we found ourselves standing underneath it. One more mile to go!! At this point, I immediately began looking for Tanya & Catrina who were going to join us for the final mile. They were nowhere to be seen. Ah, they were smart ladies and stationed themselves towards the top of the first hill on 6th street! We got ourselves up there and within seconds could see the finish line off in the distance. We ran the entire thing together. I remember feeling like emotions were supposed to be pouring out (since they normally do for me), but the well was dry. I think I thanked them all for helping to make this dream possible and soon the red carpet was in view. Here we met up with Steve and he joined us for the last 20-30 feet. Arms went up in the air and stayed up until the finish line had been crossed. Done! 23:48:27. 3:48am. Next came the hugfest with the LT100 race organizers Shannon & Merilee, and my crew & pacer. The moment was a sweet one that I'll never forget. I had just finished running 100 miles twelve minutes shy of a full day! Yeah! Smiles so big we might just pop! My rock out there for 13+ hours! I made my way over the med tent for my final weigh in. 185.8. Nothing lost on the return trip! While standing on the scale outside the tent, the first waft of warm air hit and enticed me to follow it to the source inside the tent. I found a seat inside and just sat enjoying the heat and a cup of soup that a volunteer graciously got for me. Later it would take two people on either side to lift me out of that chair. About ten minutes later, Tanya came over to help me change into warmer clothes. Just the act of taking my shoes and socks off sent me into a bout with the chills/shakes. So I simply rolled off the chair and into a cot & sleeping bag to warm up. I only wish it was that easy to get back up to a standing position. Next it was back to the cabin for much needed sleep for all. I slept in an upright chair and only managed 1.5 hours before I awoke feeling dehydrated, hungry, and in pain. There was no falling back to sleep in that state! Around 9:15am, I joined Tanya and the girls as we made our way back downtown to watch the race finish. The official cut off is 30 hours (10:00am). We caught the last twenty minutes of finishers and I can tell you there is nothing more inspiring than watching the people who have been out there the longest finish with large crowds cheering them in. The final finisher came in with two and a half minutes to spare. Shortly thereafter, we went to the awards ceremony. It was hot (inside the gym) and my body was in non-stop pain. 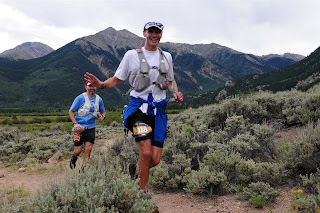 I don't remember much except for sitting next to Patrick (who finished in 13th place for his first 100 miler!) and getting my buckle. Ah, the buckle. I'll never wear it, but everything written above comes pouring out every time I look at it. Although..now I'm thinking it looks a little lonely. Do you agree it needs a friend? Maybe next year! Dedicated to my amazing crew and pacer! I am so grateful for the sacrifices my family made to support me through this experience. Many hours were dedicated so I could selfishly run 100 miles. I'm humbled by your generosity. Tanya - You are the best and I can't thank you enough for your encouragement on all these "crazy" running endeavors. We always say that we love "doing" life together. I'm not sure this was what you had in mind, but isn't life grand? I love you. Megan & Zoe - Running may be a gift to me, but it is one I can put aside in a heartbeat. You two are the gifts that mean more to me than you'll ever know. Megan, I forgive you for telling me I wouldn't finish! Haha! Remember, daddy always finishes what he starts! Scott - You were my rock out there. I'm quite sure I'd still be wandering the trails of Leadville now had you not been with me each step of the way. You are much more than a cousin to me. You are a friend and brother and I'm so appreciative of our relationship. Jennifer - Your job as Kids Crew Chief was huge! Caring for the six kids all day & night may have been more challenging than running in the race. None of this would have happened had you not been there for the kids. Thank you! Steve - The man of many hats and titles. Your pictures tell the story of this insane adventure more than my words ever could. I'll savor the hug of brothers we shared at the finish. I'm so thankful for you and that you were there to see this unfold! Catrina - Can you believe what your husband did? You are married to a stud! Thank you for all you did with venturing the road to Winfield, prepping me for the second half, and KICKING me out of that chair at Fish. It may not have seemed like much, but that moment was a turning point in the race. Friends & Family: Thank you for praying for my safety and health. Thank you for tracking my progress online. Every time I stepped on a timing mat, I gushed with adrenaline thinking about you getting the update that I was keeping pace with my goal. Thank you for all the kind emails & calls you gave before, during, and after the race. I'm feeling the love! Life Time Fitness: Your team is a class act and has done so much to make this race one of the finest experiences I could ask for. The changes you made this year were excellent and didn't diminish the "Leadville" feel that everyone has come to know and love. I'm still amazed you donated $117K to the LT100 Legacy Foundation so kids from Leadville can get college scholarships. Well done. Thank you Scott, Shannon, Ken, Merilee, and everyone else involved!